Doug Conn is a book guy. We are big fans of his Tricks of My Trade (written by Paul Cummins) and this two-DVD set brings the tricks from those books to life. 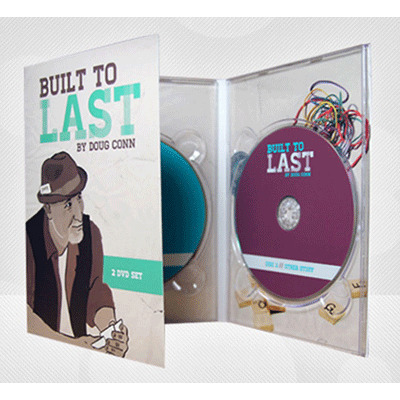 Built to Last is an apt title because these tricks really are built to last a lifetime in your repertoire. If you have been lucky enough to see him perform live, you may be wondering why he didn't do a video project years ago. There is a special care and beauty in the way he handles his magic, and it is absolutely fooling to watch. At long last, Doug has agreed to get in front of a few cameras and many of his most popular items, and a few new things, have been captured for your viewing pleasure. But you won't just watch... You. Will. Do. This. Stuff. His magic begs to be performed for laypeople but has the inherent qualities that happen to fool most magicians at the same time. Moreover, each item, whether old or new, is built to last a lifetime. These are neoclassics. The first disc contains a dozen tricks all utilizing playing cards in unique and absolutely stunning ways. If you want to give your 52 pasteboard friends a rest, no problem! Disc two is full of incredible non-card magic with coins, rubber bands, sponge bunnies (it's actually a good routine!) and even Scrabble tiles. Also included are his ideas for creating plausible presentations to establish believability, and his boiled down Doug Conn Theory Section. Doug Conn is an exceptional magician, and Built to Last is the best way to see his material come to life! Almost three hours of magic on two jam-packed DVDs, all packaged in a full-color six-panel fold out case. I'm really happy with this set! I loooooove the Scrabble effect!